Between February 11 and July 16, 1858 the Blessed Virgin Mary appeared on 18 occasions to Bernadette Soubirous in Lourdes, France. 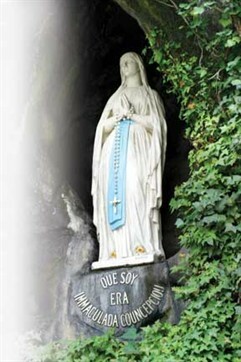 In the nearly century and a half since this series of apparitions, Lourdes has become one of the most popular pilgrimage sites in the Christian world. By her words and actions at Lourdes, Our Lady affirmed her title of the Immaculate Conception and taught the world lessons in simplicity, humility, perseverance, prayer, penitence and healing. Ever Immaculate Virgin, your divine Son has often sent you to teach and inspire His struggling people on earth. I come before you today as your child, with confidence that you will hear my needs and intercede for me with Your Son, Jesus. Just as He heeded your word on earth, He will grant what you ask in Heaven. Pray for me and those I love, dear Mother, that we may always be accepting of what your divine Son wills for us. Amen. Send your prayer petition to be included in Our Lady of Lourdes Novena. Throughout the ages, Mary has chosen to grace with her presence the simple and the poor, seldom the worldly and sophisticated. Often she appears to children, as in the case of Bernadette Soubirous, a poor, sickly child of fourteen. After a failure of the family business, Bernadette’s family was nearly destitute. Because Bernadette’s father had been unjustly accused of stealing, he and his family were looked upon with disdain and mistrust by many of their neighbors. Thus, many in Lourdes refused to believe that the beautiful lady whom Bernadette insisted she saw was anything but a hallucination. After all, why would the Mother of God appear to a Soubirous? O Mary, our heavenly Queen, you looked with favor on the pure heart of the child Bernadette. You entrusted your message not to the learned and haughty or to those with wealth and reputation, but to this child of poverty. Whenever I am tempted to inflate myself with pride and self-importance, help me remember humble Bernadette, who, although despised by her neighbors, knew that the Mother of her Lord had befriended her. Let me remember that you are my Mother and my friend as well. I ask this through your Son, Jesus Christ. Queen of the Holy Rosary, by looking with approval upon Bernadette as she prayed the rosary, you revealed to us your great love for this beautiful form of prayer and contemplation. As your child, never let me forget this. In memory of your glorious appearance at the Grotto in Lourdes, I resolve to pray the rosary often. Blessed Mother, I pray, intercede with your divine Son, that He will grant me the grace to keep this promise to you. Amen. Of course, Bernadette’s experiences at the grotto brought varying responses from the townspeople of Lourdes, and eventually from all over France. While many believed in the truth of her visions, others considered her a fraud or an imbecile. Monsieur Jacomet, the Police Commissioner of Lourdes, considered the growing crowds that followed Bernadette to the grotto a threat to public order. He questioned the girl unmercifully, doing everything he could to confuse her and catch her in a lie. The parish priest, Fr. Peyramale, exercised great caution at first and continually questioned the identity of Bernadette’s beautiful Lady, until at last he became her greatest champion. Through all these trials, however, Bernadette, simple and unlearned as she was, kept calmly to her story and never allowed doubt or confusion to cause her to abandon the message which Our Lady had entrusted to her. Lady of Lourdes, in your wisdom you saw that Bernadette possessed the courage and perseverance to stand up to the questions, doubts and even insults of those around her. Tests and trials seem unavoidable obstacles for all who set foot on the path of spiritual commitment. Mother of Truth, I pray that when my faith is tested, when I am mocked and scorned, when the doubts of others threaten to undermine my devotion to you and to your divine Son, you will look upon me with mercy and grant me courage and perseverance to stand up to all trials as Bernadette did. Amen. Many educated residents of Lourdes regarded the apparitions at the Grotto as merely the hallucinations of a mentally disturbed child. However, a few who came to scoff left believing that something extraordinary was happening. These witnesses were usually convinced, not so much by spectacular occurrences as by the unmistakable transformation that came over the poor peasant girl at these times. One such person was Dr. Dozous, who was a man of science, but not a religious man. He later wrote that “as soon as she had come before the Grotto, Bernadette knelt down, took her rosary out of her pocket and began to pray. Her face underwent a perfect transformation, noticed by all who were near her, and showed that she was in communication with the Apparition.” Dr. Dozous took Bernadette’s pulse while she was in this state and discovered that it was tranquil and her respiration easy. “Nothing,” he said, “indicated any nervous excitement.” Convinced, Dr. Dozous went on to champion the cause of Bernadette and of the Immaculate Conception and wrote several books on the miracles he later encountered at the Grotto. Blessed Queen of Heaven, even skeptical onlookers noticed that Bernadette was transformed in your presence. No longer an awkward, sickly child of poverty, her face took on a serene beauty and her movements were poised and graceful. We too are transformed when we place our complete trust in you and your divine Son, as Bernadette did. As we grow in faith and love, as we pray and contemplate, as we persevere in our efforts to turn away from those things that separate us from you, as we reach out to our sisters and brothers in simplicity and humility, the evidence of the grace you give to those who love your Son, Jesus, will shine forth for all the world to see. Grant me your blessings, dear Mother, as I place all my trust in you. Amen. During the eighth apparition at Lourdes, Our Lady delivered her first public message through Bernadette. Observers noted that, although she had been in ecstasy before the Heavenly vision, the child’s face suddenly “appeared sad and her arms fell to her side. There were tears upon her cheeks.” Bernadette then turned to face the crowd and repeated three times the words “Penitence…penitence…penitence!” Those near Bernadette heard the words distinctly and spread them throughout the crowd. Our Lady had made this plea for penitence at previous appearances in the 19th century and would do so again at Fatima in 1917. Then, as now, penitence is a word most of us prefer not to hear. Its repetition by Our Blessed Mother, however, means that we must not avoid it. Penitence implies a radical change in attitude and action. It means constant vigilance to recognize and weed out all that separates us from God. Mother of Mercy, you weep whenever your children reject the love your Son, Jesus, showers upon us. You saw Him beaten and spat upon on the road to Calvary. You kept watch at the Cross as He died for us. So often you have visited this world to bid us to repent of our sins. Most Blessed Virgin Mary, help me open my heart that I may realize how much you grieve for me when I reject Jesus’ love. May I remember the urgency of your message at Lourdes and resolve daily to examine my conscience and repent of all thoughts, words and actions that separate me from God. Amen. During the ninth apparition, on February 25, 1858 an event took place at the grotto that would make the name of Lourdes forever synonymous with pilgrimage and healing. Bernadette was praying the rosary when suddenly she began to scramble about on her knees, clambering up the slope that led to the interior of the grotto and back again. Finding nothing, she turned toward the River Gave, then turned back and entered the opening at the base of the rock. She appeared puzzled, then began to dig with her hands. When the onlookers saw her mud-covered face, they thought she was insane. Later Bernadette explained that the Lady had told her to wash in the fountain. Not knowing where such a fountain might be, since there had never before been flowing water in the grotto, she went toward the river, when the Lady called her back and told her to dig in a certain spot. Later that afternoon, the trickle of water became a ribbon hollowing out its own channel. Immaculate Mary, by appearing to Bernadette at the Grotto of Lourdes, you transformed it from a humble place to a holy sanctuary. Many have been healed of infirmities of body, mind, emotions and spirit at this spot. To their prayers and outpourings of faith I add my own petitions that my loved ones and I may receive healing from our afflictions. I add to these petitions my gratitude for your child, St. Bernadette, whose steadfast faith and humble obedience led to the uncovering of the great fountain of blessing and healing which is Lourdes. Grant that I may imitate her childlike virtues. Amen. Mary Immaculate, Our Lady of Lourdes, chosen from all eternity to be the Mother of the Word made flesh, and preserved from original sin, I kneel before you today, as did Bernadette at Lourdes, and pray with childlike devotion that you will help me remain faithful to my baptismal vows. Shelter me, I pray, from all assaults, whether from within or without, against my faith in your Son, Jesus Christ. Look with favor upon my petitions and secure for me a favorable response from your divine Son. Amen. Our Blessed Mother appeared to Bernadette for the last time on July 16, 1858. The grotto was boarded up by then and closed to the public, access to it denied, and use of the water forbidden. But Bernadette felt strongly called by the Lady to come to the grotto. Accompanied by her Aunt Basile, she took another path which led to the right bank of the River Gave, opposite the grotto. As Bernadette knelt, her face was almost immediately transfigured with the Heavenly light of Our Lady. “Yes! Yes!” Bernadette cried, “She is there. She welcomes us and is smiling upon us across the barriers.” After an intimate conversation between Our Lady and the seer, the moment came for the Lady to say farewell to her faithful child. Bernadette later declared that “the Blessed Virgin is so beautiful that when one has seen her once, one would gladly wish to die so as to see her again.” As the sun was beginning to set, the Lady who called herself the Immaculate Conception took her leave, ending the vision with Bernadette still in the fullness of her joy. Never again in this life would Bernadette see the Lady. Immaculate Mother, we share in your promise to Bernadette; we are not promised complete happiness in this life but in the next. Virgin Mother of God, who always keeps your promises to your faithful children, grant that like Bernadette, I may wait in serene trust for the moment when I behold you and your divine Son in Heaven. O Mary, conceived without sin, pray for us who have recourse to you. Amen.